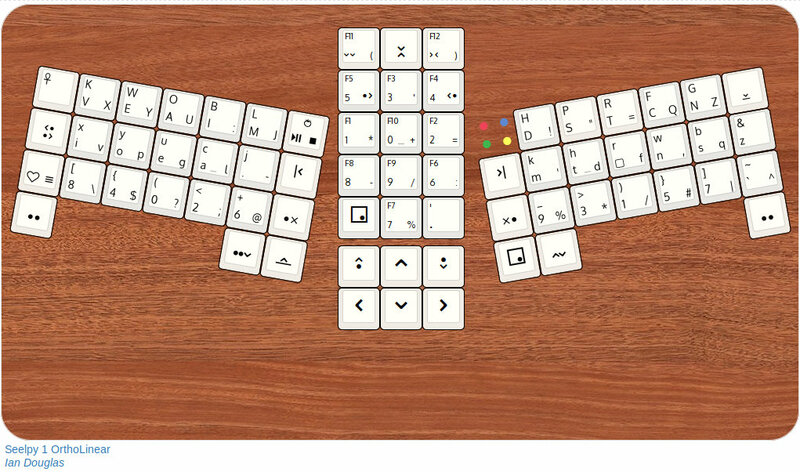 The Seelpy layout introduces a new concept in keyboard layouts, unlike anything else yet on the market (AFAIK). It is unconventional and will probably meet with a lot of criticism, particularly regarding the learning curve. I have not yet tested the layout myself, so that discussion may be a bit academic right now. In the scores below, the previous best layout overall was X6.4H, but ignore that and look at the gap between Seelpy 1 and the next best. That should put things in perspective. It's different from QWERTY QWERTY is terrible. Any improvement is better. It's too different from QWERTY Yes it is. You use about half as much effort to type, compared to QWERTY. It's impossible to learn. Maybe. Jury is still out on this. I will build one to test. Ctrl-X/C/V is broken. Yes, like MTGap or Dvorak or Vu Keys or Maltron or Arensito, all of which are way better than QWERTY. There are workarounds. The traditional shortcuts are still doable, even on the left hand, you just need to add Shift (left thumb) to the combo. On the positive side, this helps prevent accidents. The Ctrl-v is more problematic, I suggest mapping Ctrl-y to Paste instead, then the hand actions are the same for all three. Ctrl s/n/t/z are now on the right hand in easy access. Ctrl-p and r are problematic, as is Ctrl-b. Ctrl-a and i are okay on the left hand. Arensito's key innovation was putting the digits and punctuation on the AltGr level. People with European keyboards are already familiar with that concept, but it is normally used for the high-ASCII characters like é, ñ, ç, ø etc. So putting the digits and regular punctuation on that level was a breakthrough. Note where Schizo puts Space and Enter ... on the AltGr level. The 'unique' thing about this layout is that the h/H is on the space key. Even worse, h is on the AltGr level, but despite this (or because of it) it still gets the best scores. But the difference in scores between that and the X6.4H was generally ± 0.5, nothing to get excited about. The plan was rapidly taking shape.... a three-row setup, with Caps on top row, lower case on home row, and digits and punctuation on bottom row. Since we have 10x3 slots on each row (or 11x3), and only 26 letters, we could put the most used puncutation on home row as well, and another four on top row. And so here is Seelpy 1. I also have two variants, but both of them have problems... you could switch the space to the right index, which produces better scores, but then the right finger flies around a lot. The other variant puts Space on Shift-AltGr, but I'm not even sure if that's allowed, and it also destroys the chance of putting anything else on the keys that requires shift-altgr-key. That variant actually gets the best scores overall.